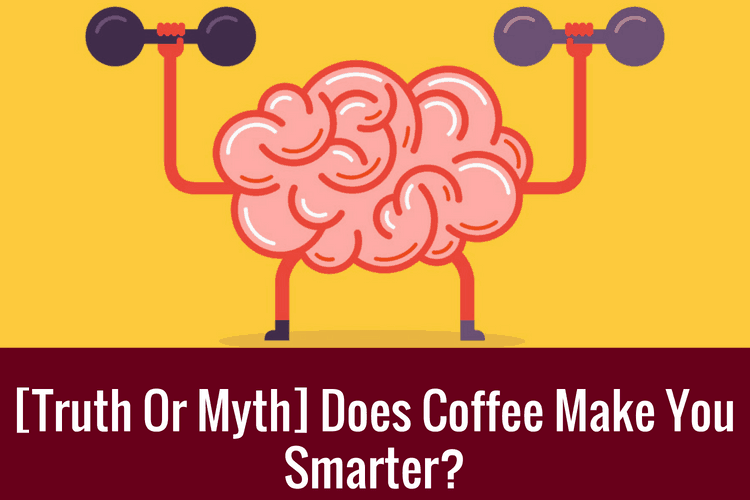 [Truth Or Myth] Does Coffee Make You Smarter Really? Does Coffee Make You Smarter? Imagine this. Whether you are a student studying into the dead hours of the night or an office employee trying to concentrate on their work. Even a mom trying to sooth her child to bed, coffee has long been associated with achieving these tasks. That perk of caffeine to give you the buzz you need to get you over the finishing line. What effect does it have on the body though? And can it actually make you smarter? Intelligence can mean many different things to many people. A lot of people interpret it to be someone’s ability to remember the information that they have taken in. The way people are tested in schools often isn’t their ability to think logically or critically, but to test them on what they remember from their lessons and their books. Whether intelligence should be tested as someone’s ability to remember a piece of information, or not, is a hotly debated topic. An IQ test, for example, is the complete opposite of this approach as no amount of revision could make you significantly better or worse at the test. It tests your ability to work through a problem and find logical solutions to difficult tasks. Someone with the highest IQ of all-time, however, might not have the natural instincts to soothe a baby when it’s crying. That is surely another form of intelligence in its own right. Whether it is working out how to pass a test, working out a maths problem or how to best raise a child. The different types of intelligence are vast, but it’s clear that some people are more intelligent than others, with many seeking ways to improve. The brain is an incredibly complicated and masterful piece of biological engineering, and something that we still have a lot to learn about. There is a delicate balance between what intelligence is, and what isn’t. The more focused you are, the more information you are able to retain. Being able to use your brain to its full capacity allows you to achieve any tasks more quickly and to a higher standard. There are many different forms of intelligence in the world. But, there is no doubt that if you’re performing to your highest level; more often then people will perceive you to be more intelligent. Dopamine has long been associated with having a positive impact on your happiness. But what many people don’t realise, however, is the other impacts that dopamine has on the body. And also the fact that coffee can stimulate your dopamine production. It plays a critical role in emotional and mental health. The behaviors associated with the chemical also include motivation and desire. It isn’t only mental function, as dopamine can affect your motor function too as well as cognition food intake and numerous other vital bodily functions. It really does have numerous side effects which can all have a positive influence on your body. A 1998 review journal call Physiological Reviews stated that problems with the production of dopamine can be linked to such disorders as Parkinson’s disease and schizophrenia. So dopamine isn’t just there to make you happy. It plays a number of vital roles within the body. Some of which can also help by keeping you focused and increasing your motivation and desire. What Is The Relationship Between Caffeine And Dopamine? Caffeine may not be a strong drug in the doses that we’re used to taking it in, but its effect on the body can lead to some big changes. Obviously, it is most well-known for its ability to provide energy to the body artificially as people seek out caffeine whenever they are tired and need to focus. It doesn’t just do that however, and can also stimulate the production of dopamine. This is a secondary effect that a lot of people wouldn’t expect with coffee. Conversely, this is a big reason why coffee is such a popular drink. Not only does it give you an energy boost, but it also makes you happier in the process. Caffeine can obviously be found in numerous products as well. This is also a way to explaining the popularity of fizzy drinks that contain a lot of the chemical. And also explain why chocolate is so popular. What Effect Does Caffeine Have On Dopamine? The dopamine levels in your body are certainly important. And everyone feels better when they have more dopamine running through their body. In many respects, caffeine has the same effect on the body as cocaine and methamphetamine does, but much less. This feel-good feeling will make you crave coffee even more and therefore increase your intake of caffeine. Of course, this will then further increase your levels of dopamine. This is the kind of cycle that can lead many people to have numerous cups of coffee throughout a day. Unexpectedly; leads to an increasing amount of dopamine throughout the body. Be aware though. Just as with any drug, resistance can build up and your body. What this means is caffeine effect could have a diminishing return on your body. And I mean the good part of it. What Is Acetylcholine And What Does It Do? Acetylcholine is one of those bodily chemicals that have a small, but vital role in the body. It helps your body in transferring signals around your nervous system. It is a neurotransmitter that passes messages between nerve cells and binds them to receptor proteins. These receptor proteins are located in your brain and throughout your whole nervous system. The acetylcholine molecules are very small which can make their messages through your cells extremely quick when compared with other neurotransmitters. They play a vital role in sending messages all across your nervous system. However, when it comes time to sleep, your brain requires their levels to be lowered so that it can recover from the day. What Is The Relationship Between Caffeine And Acetylcholine? That lowering of acetylcholine in your brain is where it can have a problem with caffeine. In your sleep, acetylcholine is shut down by a natural sedative. This shutting down means that your body can form chemical links that are required to remember the words in your vocabulary. But, caffeine can block this sedative from working correctly meaning that the levels of acetylcholine never drop to the levels that they should. This block that is placed on your brain by caffeine can mean that the chemical links can’t be formed. Therefore, it can affect the brain’s ability to remember what you’ve learned throughout the day. Often with caffeine, the initial boost can be great for you. But you wouldn't want to consume it too late in the day. Why? The effects can last a long time. Caffeine has a long half-life of around 5-6 hours and the rest can take up to days to get out of your body. What Effect Does Caffeine Have On Acetylcholine? When you take caffeine into your body it naturally raises your level of acetylcholine in your body. This is not a problem during the day as it means your neurotransmitters will be firing as they should, but it’s when you sleep that a problem can occur. Studies have shown that your level of acetylcholine reduces when you sleep in order for your brain to be able to store the information that you’ve has throughout the way. With caffeine raising these levels, it seems they are artificially high before you sleep and therefore can’t be lowered in the way that they need to be. This can cause your brain an issue in trying to retain the information that it has received. All that hard work that has been done in the day can all be undone if you can’t store it away as it’s important that your brain is able to switch off while you sleep. And having caffeine running through your body can disrupt this for a few reasons, with one of them being the levels of acetylcholine that is keeps in your brain. The Big Question: Does Caffeine Make You Smarter? Clearly caffeine can have an impact on how your brain processes information, but is that impact positive or negative? We know that sleep is very important for your brain. This is to allow it to recover and store the memory that you have gained throughout the day. The rise in acetylcholine hinders this process, and is a situation where caffeine can be harmful. On the other hand, the increase in dopamine, however, allows your body to get an increase in a crucial chemical that can increase your motivation and desire. Whether it makes you smarter or not would depend on how you judge intelligence. It’s hard to reason that having coffee just before an IQ test would make you better at it, as it wouldn’t be able to make your more logical or a critical thinker. In this respect, just having caffeine won’t naturally make you smarter, as the brain is more complicated than that. Intelligence however is often judged as the ability to gain and process information. Caffeine would be able to help in this respect at it will change the state of your mind and make you more alert. That alertness can be channelled into more studying time and still being able to use your brain at full power when it’s needed. If anything, caffeine can often bring you back to your maximum level of "intelligence", as tiredness can make simple tasks more difficult. Its effect on sleep, however, could undo all of that good work if your brain can’t switch off while you’re sleeping. Caffeine should always be taken with caution as too much can have a negative impact on your health and make you struggle to sleep. Caffeine might not directly make you smarter, but when used in the right way, it can help you give the tools to get the result that you’re looking for. Coffee is one of the most popular drinks in the world for a reason. Not only do many people love the taste, but it can give you that boost of energy when you most need it. If you’re struggling to finish your work, then it can be a great help to get you over the line.